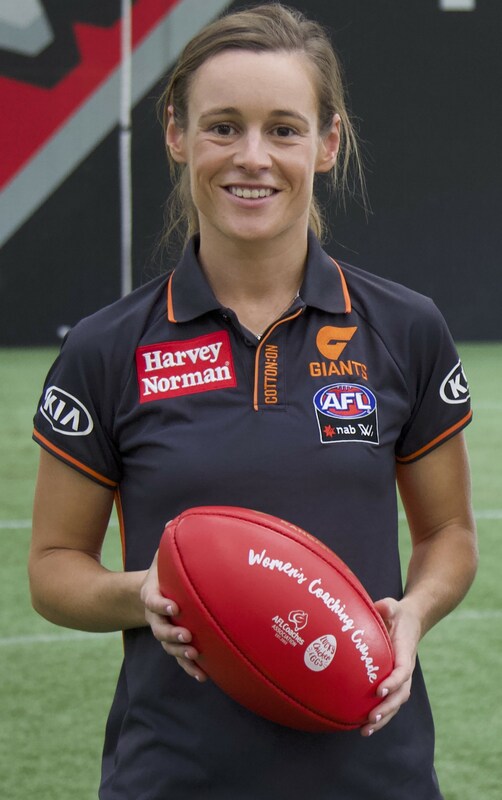 GIANTS AFLW vice-captain and GIANTS NEAFL Development Coach (Backline), Alicia Eva, has been awarded the inaugural AFL Coaches Association & Lucky Chicken Eggs Coaching Pathway Scholarship for 2019. Not only is Eva one of the best players in the AFLW but she is also beginning to make an indelible mark on the game through coaching. In 2019 she was appointed as the GIANTS NEAFL Development Coach (Backline) off the back of her 2018 coaching roles as Head Coach of the AFL NSW/ACT Under 18 program and as GIANTS Academy Assistant Coach (Midfield). The AFL Coaches Association & Lucky Chicken Eggs Coaching Pathway Scholarship, announced earlier this year as part of the AFL Coaches Association & Lucky Chicken Eggs Women’s Coaching Crusade, was hatched out the need to support ambitions of AFLW players and fast-track their development to coach at the highest level. As part of the scholarship, Eva will be afforded incredible opportunities and experiences over the next twelve months which include upskilling through the AFL Coaches Association’s Next Coach Program, a funded position on the AFL Coaches US Study Tour and significantly, a mentorship from current Essendon Football Club Senior Coach and Premiership winning, 350 game AFL coach, John Worsfold. AFL Coaches Association CEO, Mark Brayshaw said Eva was a fitting inaugural winner. "Alicia was selected from a strong field of nine, which is a feather in her cap but also a great sign that AFLW players are thinking about a career as a coach. Alicia’s application left us in no doubt that she's deadly serious about coaching. She has a bright future and we think our Coaching Pathway Scholarship will assist her development greatly,” Brayshaw said. “None of us were surprised when John offered to mentor Alicia. In the early days of Level 4 program, before he joined the Bombers, John was an active mentor of several of those young coaches. I'm certain Alicia will quickly connect to Woosha and learn a lot from him. Morry Wroby, CEO Lucky Chicken Eggs added to Brayshaw's sentiments around Eva's recognition. "Alicia is inspiring on all counts. Her passion and commitment is an inspiration to young women everywhere, and her achievement being awarded the Lucky Chicken Eggs & AFL Coaches Coaching Pathway Scholarship is certainly well-deserved. It’s time to shine a light on more women in AFL coaching positions and Lucky Chicken Eggs is proud to be supporting ambitious women like Alicia, to take the lead and pave the way for change," said Wroby. Eva’s passion for coaching began at the age of 18 when she tapped her Dad on the shoulder to take over the reins from him to coach at her local club, East Malvern Junior Football Club. Over the last nine years, Eva’s hard work, commitment and passion have seen her gain a number of coaching roles and experiences with both male and female teams through the TAC Cup Competition with the Calder Cannons, in the AFL’s National Talent Program, for AFL Victoria’s Youth Girls, and to her current roles at the GIANTS. Eva, expressed her gratitude at being named the recipient of the 2019 AFL Coaches Association & Lucky Chicken Eggs Coaching Pathway Scholarship. “I’m so grateful, this is a pretty special opportunity and it means a lot to me. Not only is it going to provide me with incredible ways to continue to develop my coaching brain, but will also significantly contribute to my off field development,” Eva said. “I’m looking forward to completing the Next Coach Program, attending the US Study Tour and having someone as experienced as John as my mentor – already after our first meeting I’m buzzing. 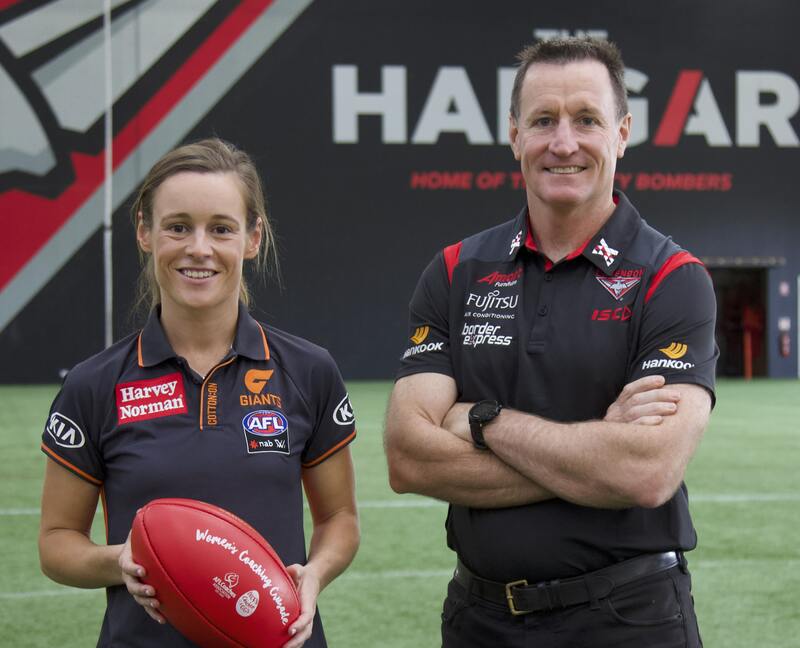 A keenness to assist young people in the game and knowing the importance of strong mentorship, are a few reasons Bombers Senior Coach, John Worsfold, will carve out time in his busy schedule to mentor Eva. “I’m passionate about offering help to young people in the game. I’ve been very fortunate with what the game has offered me through opportunities and people in the industry who have given me their time as mentors, or just someone to talk to,” Worsfold said. The AFL Coaches Association & Lucky Chicken Eggs Women’s Coaching Crusade will shine a light on AFL coaching as a career for women, aiming to attract and upskill more women to coach at the highest level. A second scholarship will be awarded in 2020. Photos supplied by Essendon Football Club.